I received a call shortly after midnight and mindlessly picked it up. I don't remember looking at the screen or even opening my eyes, but I felt its importance and answered. I can't even remember who I spoke with (I was in a very deep sleep), I think it was Lexi's husband, William but all I knew was that Lexi was in labor and headed to Stone Oak Birth Center. Lexi has a history of quick births, so I jumped out of bed, brushed my teeth, told my husband where I was going and left. I arrived to the birth center before they did and wanted to make sure they had enough time to get settled and checked before I came in so I ran to a corner store to get cough drops for William and coffee for me because I needed it! I arrived back to find Lexi laboring outside and I was invited to go in and wait. I still didn't want to be too disruptive so I stayed in the lobby until I was called on. A few minutes went by and I started to get anxiety because of how quickly she labors and births so I stepped outside to go check on her but she was gone. When I walked back in one of the Julie, one of the midwives, was looking for me and rushing me in the room. I walked into the birth suite to the tub being filled up and Lexi going through some pretty intense contractions. When she got in her body relaxed a little and then the intensity of the contractions seemed to pick up. She was resting any chance she got, and William was stroking her head and belly to support and comfort her. Lexi became uncomfortable the way she was laying in the tub so she sat with her back against the back of the tub and pulled her legs back. At 2:27AM Hailey Elise made her way into her loving mothers arms. 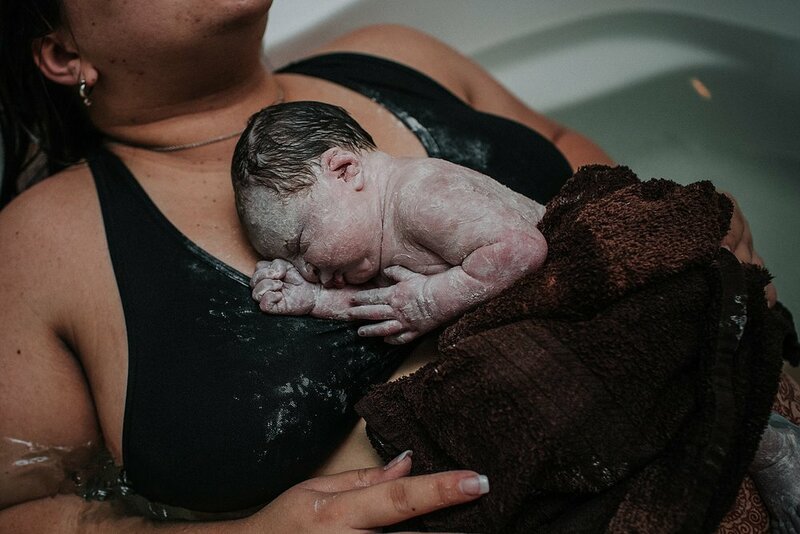 It was a quick, intense and beautiful labor and birth and I am in such awe of Lexi and her strength and William and his loving support for both Lexi and Hailey. William took Hailey and did some skin to skin with her while Lexi got cleaned up and headed to the bed. Both parents were in awe of their tiny new bundle. William had the opportunity to cut Hailey's cord and Lexi began nursing her with love.